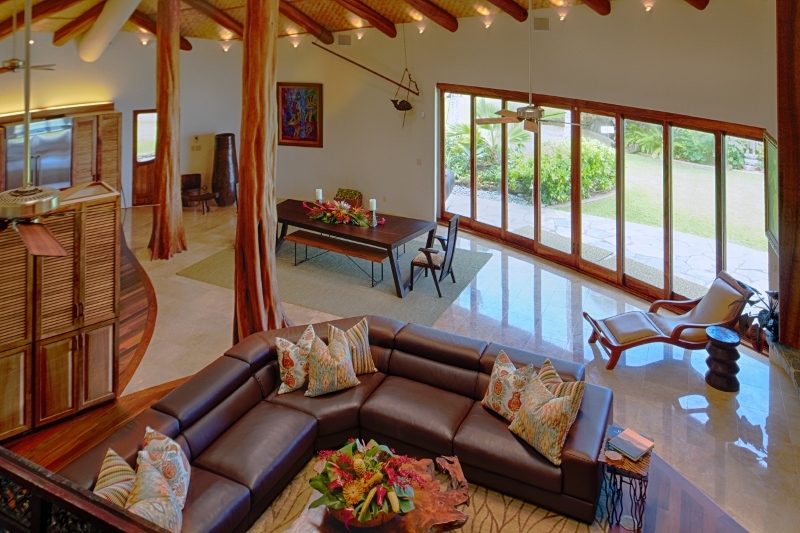 Paul Mitchell Estate – Luxury Vacation Homes, Inc. 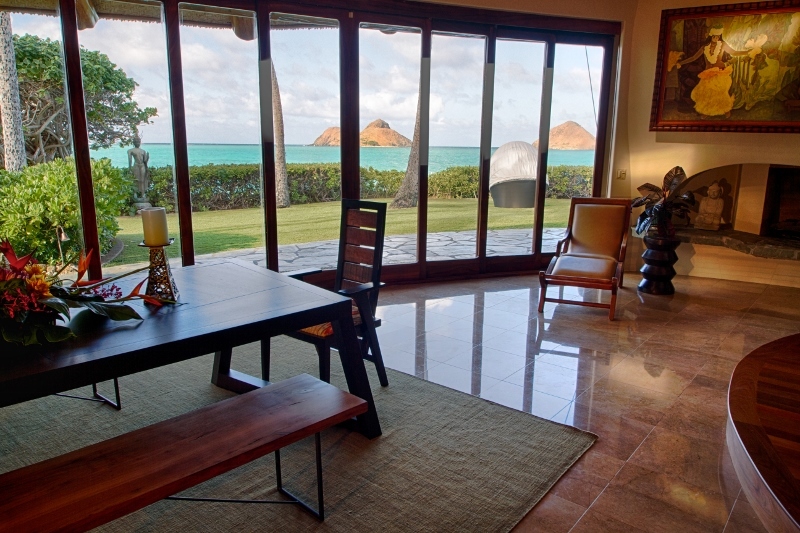 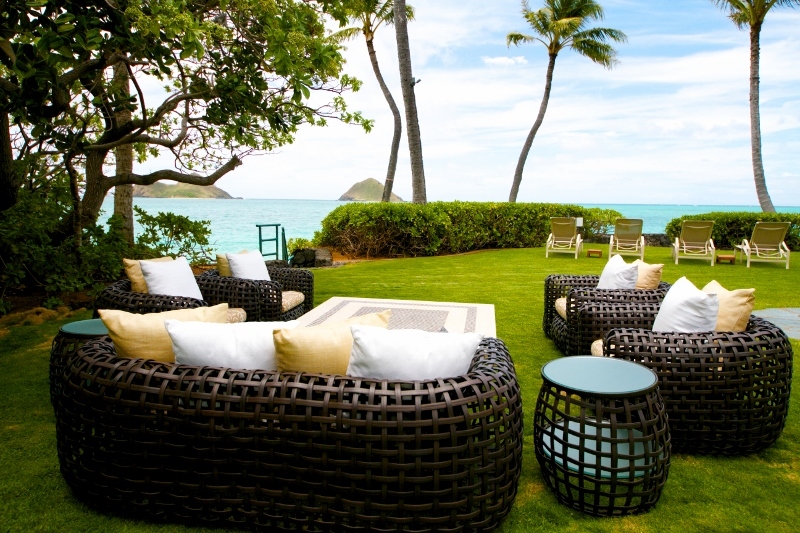 The Paul Mitchell Estate is situated in a 1.3 acre security-gated, beachfront enclave in Lanikai on the windward coast of Oahu. 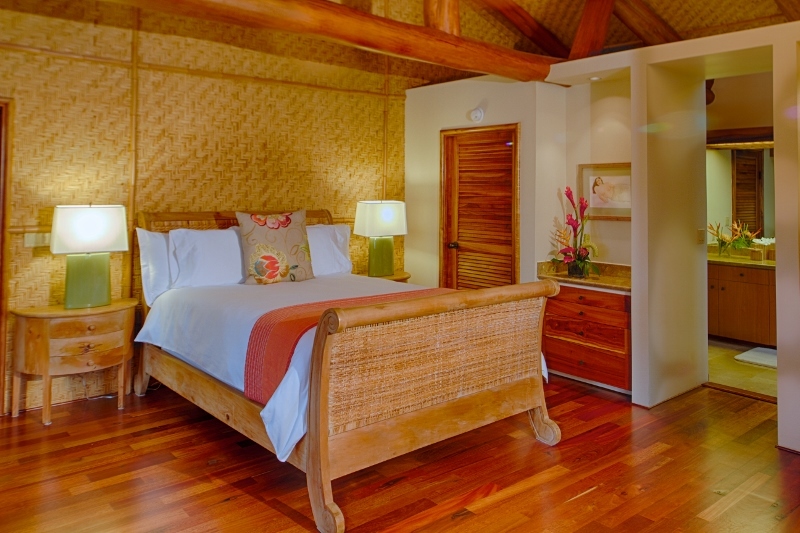 Set amidst towering palm trees and vibrantly-hued tropical flowers and foliage, one of America’s leading entrepreneurs created his modern-day vision of the quintessential Polynesian village. 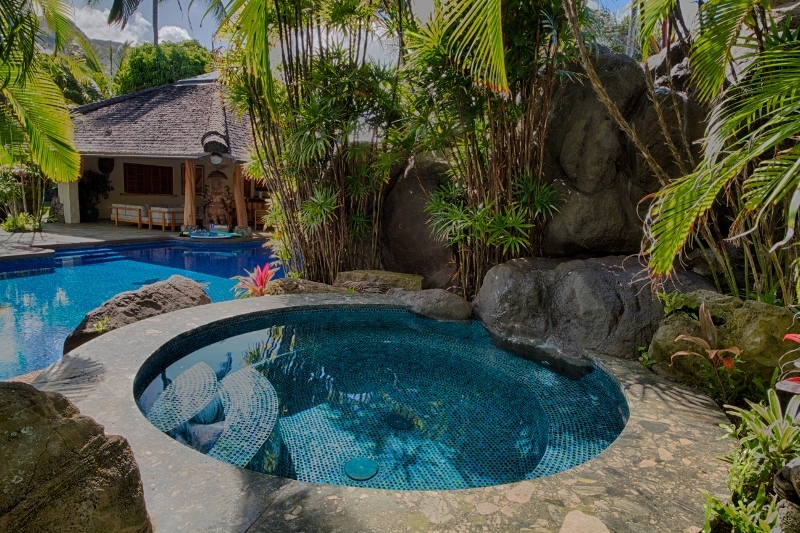 The Estate is exquisitely decorated in an aesthetically pleasing combination of elegantly crafted Balinese rattans, Oriental antiques and Hawaiian period furnishings to produce a kingdom worthy of Pacific island royalty. 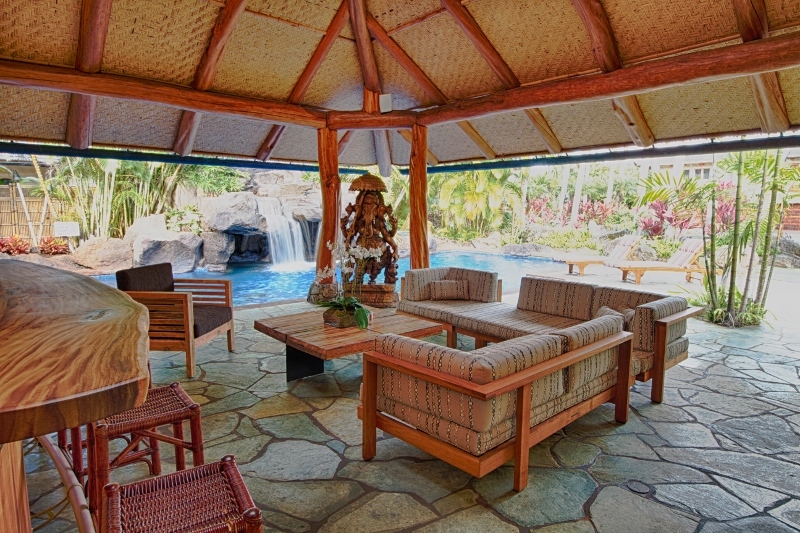 The seven separate buildings of the 11,000 square foot estate are architecturally unified by gracefully rounded stucco walls and roofs that are capped by wood shakes made from hand-split Indonesian ironwood and fringed with feathered palm fronds. 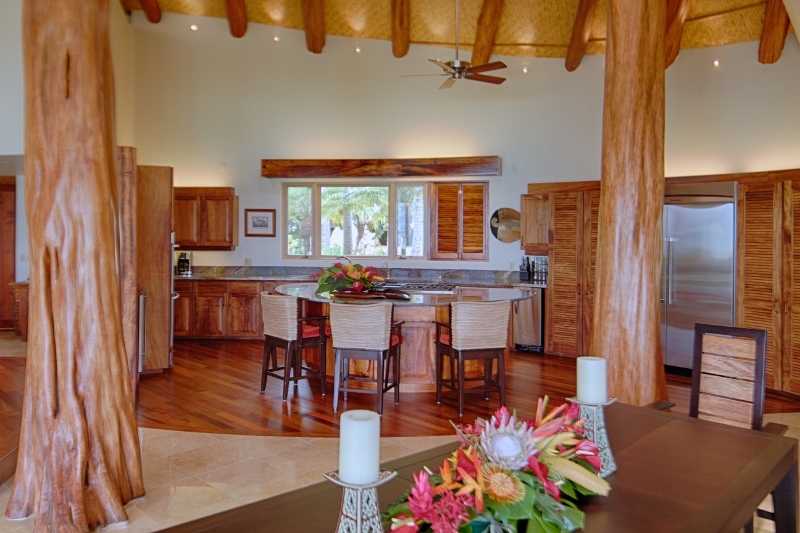 Throughout the property the high, peaked interior ceilings of the buildings are covered with finely woven grass-cloth matting and are cross-timbered and supported by columns and beams consisting of native Hawaiian ohia tree logs. 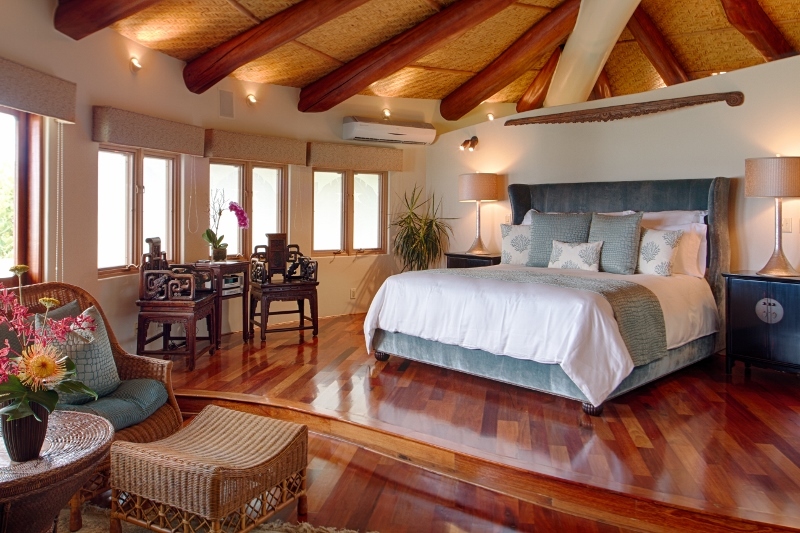 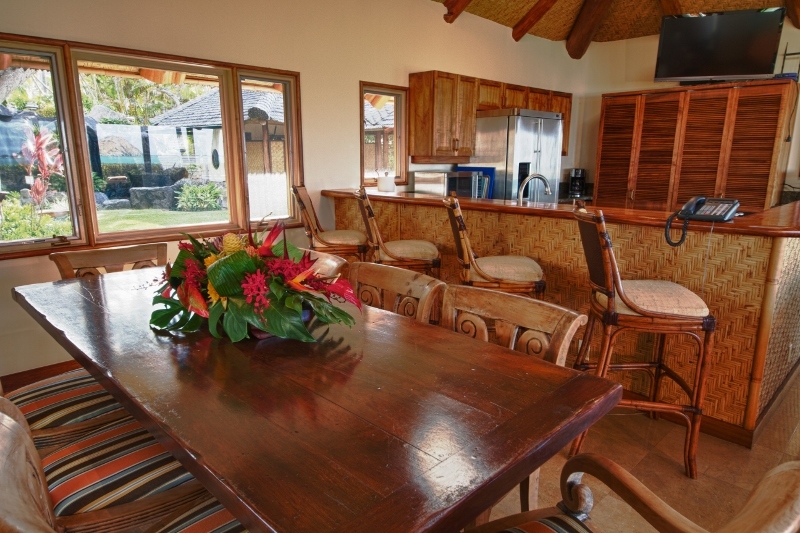 Other notable features include solid teak doors which were hand-carved in Bali to depict traditional Polynesian patterns and motifs; rich Hawaiian koa wood cabinetry; and, floors and walkways of a variety of polished hardwoods, gleaming marble, and sealed flagstone. 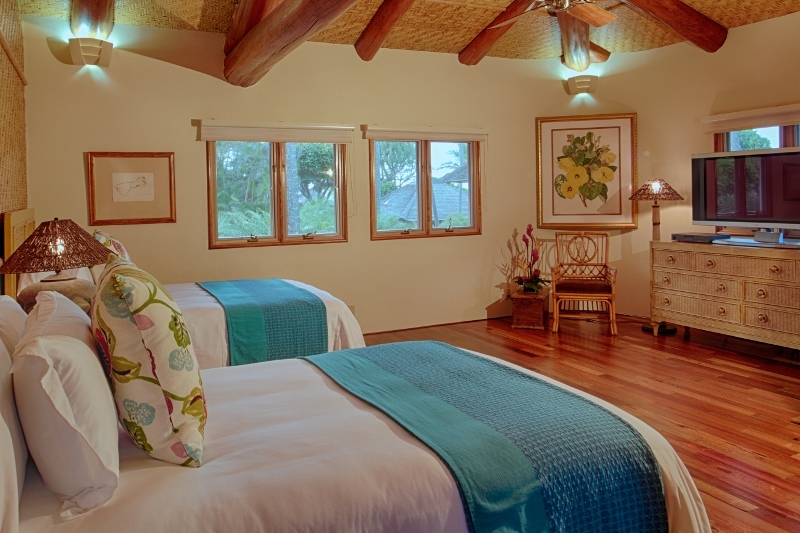 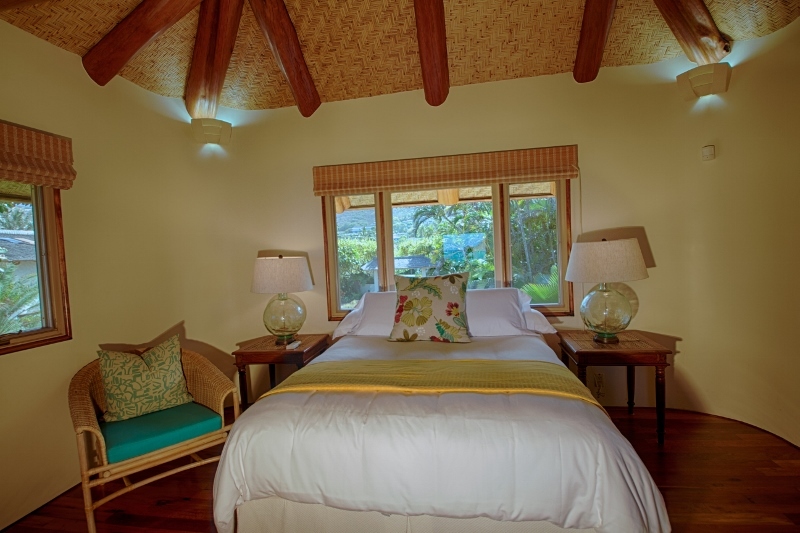 In keeping with the traditional Polynesian lifestyle, the various buildings on the estate have high ceilings, skylights and/or fans and an abundance of glass doors and louvered windows that can be opened to allow natural cooling and ventilation by the prevailing tropical trade winds. 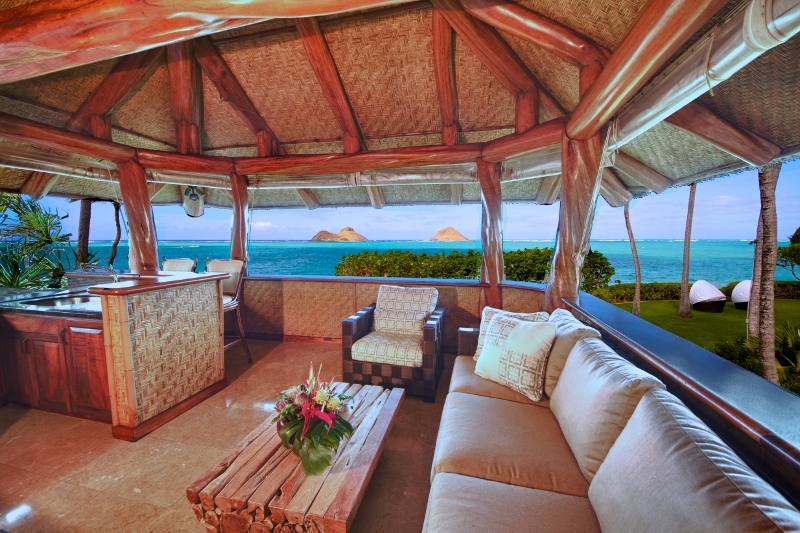 The ocean side of the estate opens to gorgeous vistas of reef-protected, azure waters and of the picturesque Mokulua Islands located a short distance offshore. 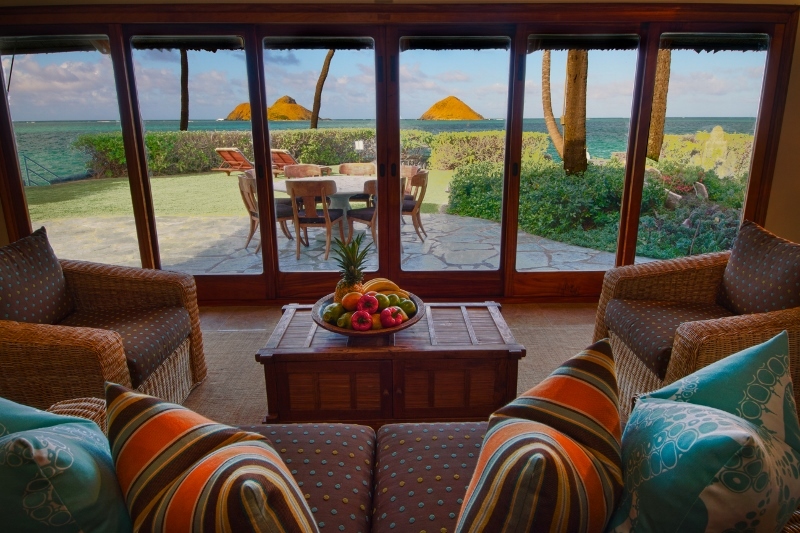 An arbor-lined pathway leads to a secluded beach cove where guests can enjoy sun bathing, kayaking, windsurfing or ocean swimming in relative privacy. 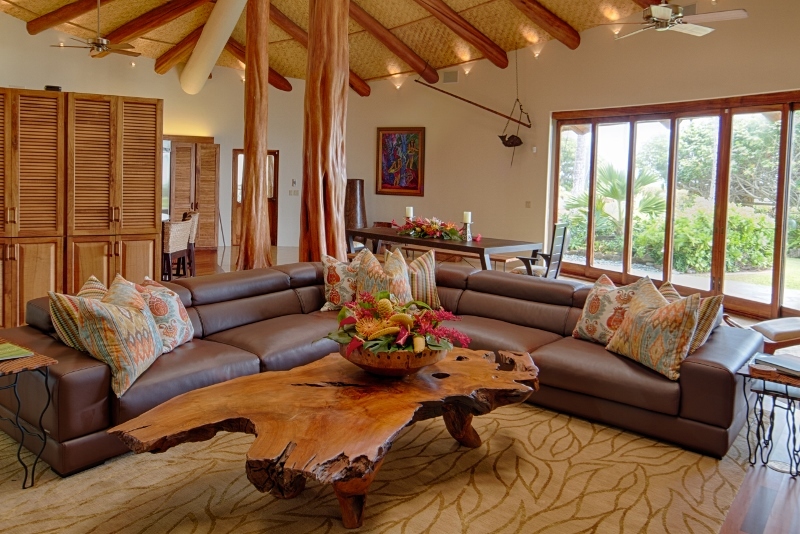 The Main House features a cavernous, oceanfront living and dining area where the 25ft tall ceiling is pierced by multiple skylights which bathe the richly crafted woods and exotic decor with a natural radiance. 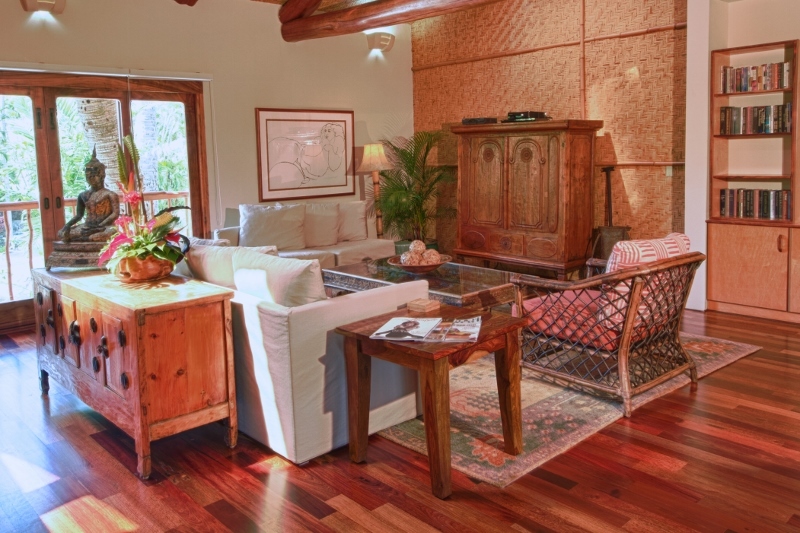 The Main House also contains a professional-grade kitchen, lovely decorated living room and dining room, as well as two of the estates seven bedrooms. 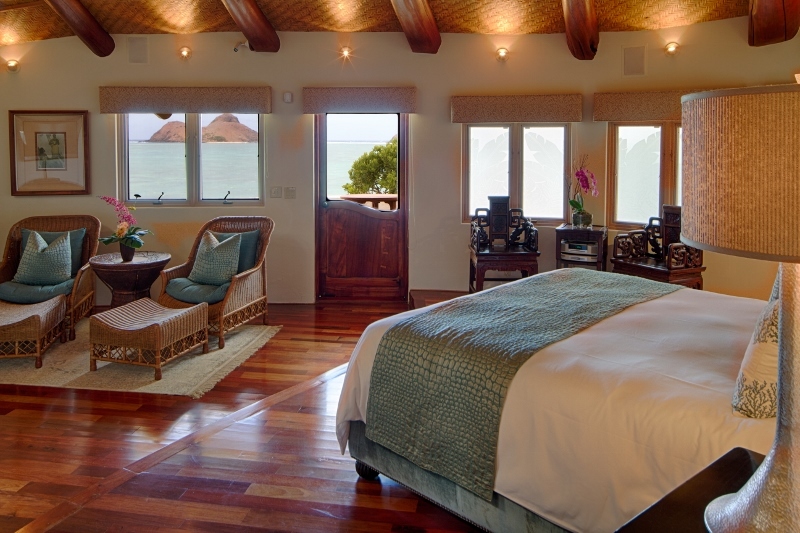 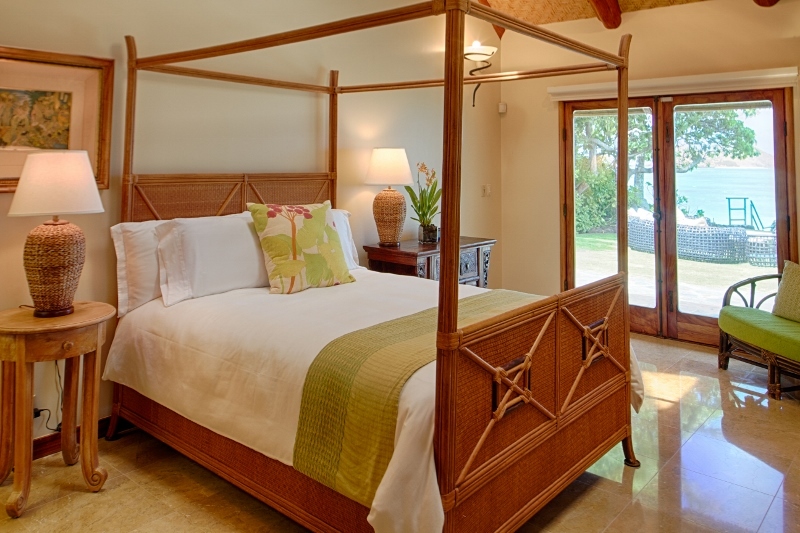 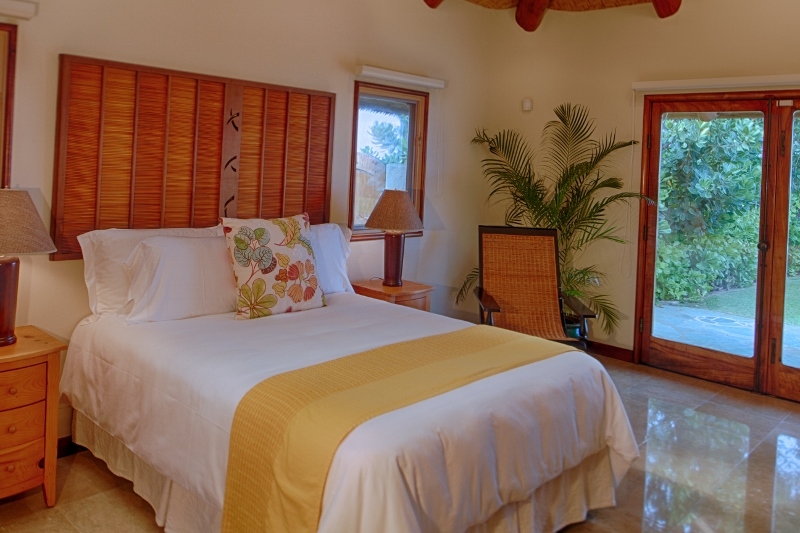 The oceanfront master bedroom suite provides guests with a fireplace, flat screen plasma TV with swing arm for easy viewing and a marble bathroom with a lavatory, bidet, shower and air tub. 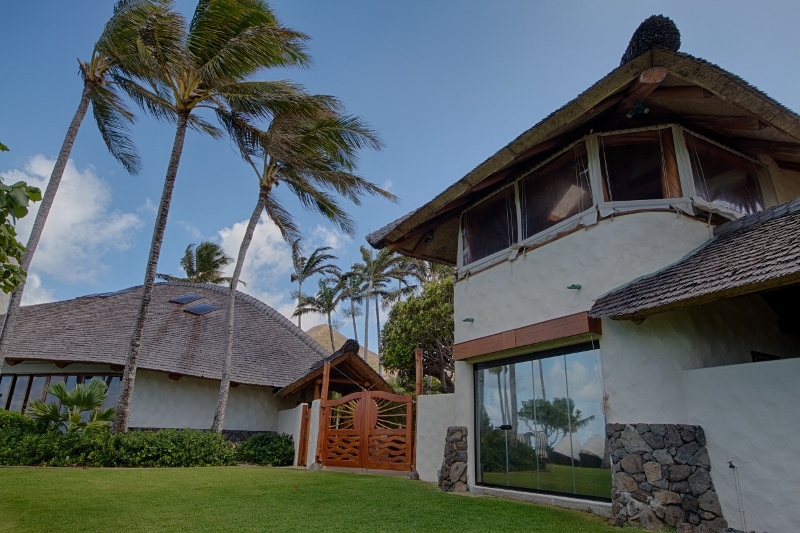 Covered flagstone pathways, lined by native ohia logs, meander past the Boat House, which has an upstairs crow’s nest bedroom suite and its own oceanfront sitting room and wet bar, along with gym area and an additional bathroom located below, then onward to a Guest Service Pavilion which contains an oceanfront living/dining area, 42″ plasma TV, DVD/CD/VCR player, ceiling fan, a wet bar and a full kitchen. 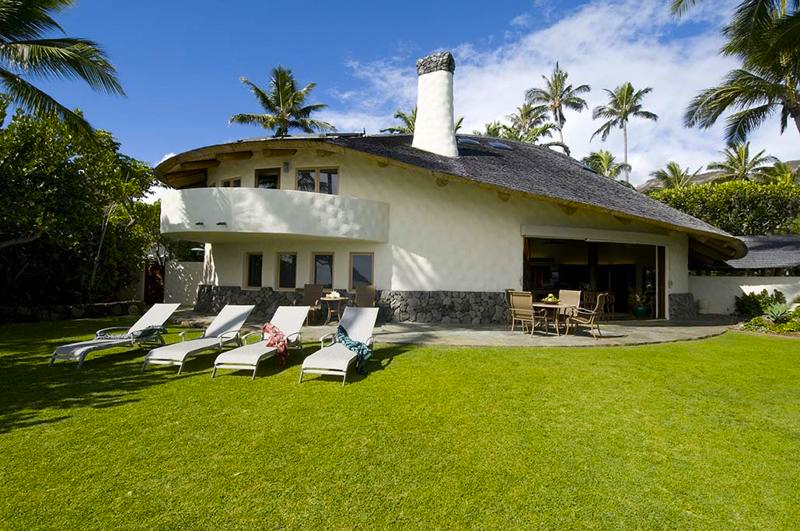 Just beyond the guest service pavilion the pathway leads to the Guest House which contains the fourth and fifth oceanfront bedrooms. 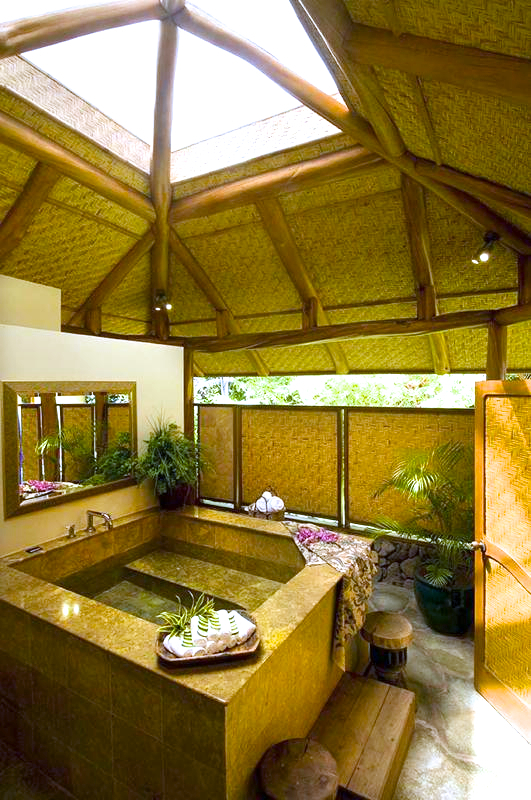 The Bath House, complete with a Japanese furo tub, tatami mats, a sauna, a garden shower and a koi pond, is located behind the Guest House and is adjacent to the pool area. 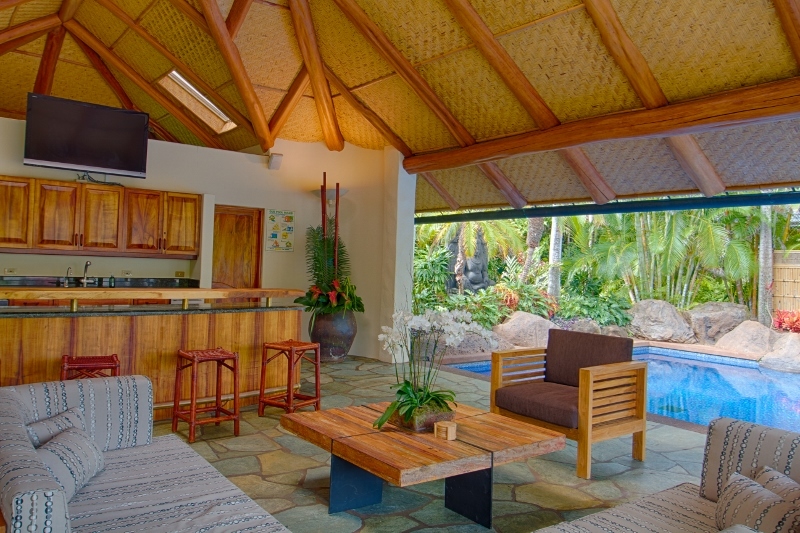 The covered Pool Pavilion with its high ceilings, ohia log columns, mini-kitchen with fridge and ice maker, wet bar, stereo system and full baths with showers/changing rooms serves as the focal point for outdoor relaxation and for informal entertaining and dining. 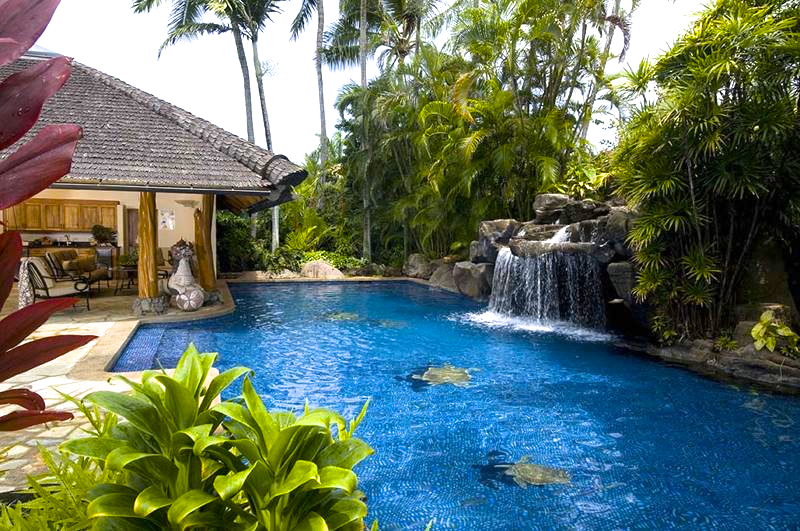 The lagoon-style heated swimming pool and spa area is surrounded by flowering tropical foliage and is accented by a waterfall cascading over natural boulders into the pool to provide an environment of total relaxation. 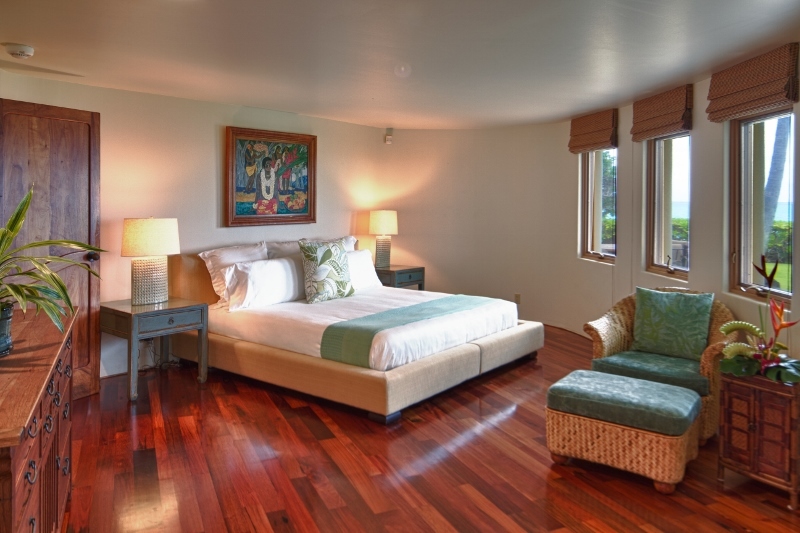 The Garage Apartment is located above the three-car garage, overlooking the circular drive and interior courtyard of the estate. 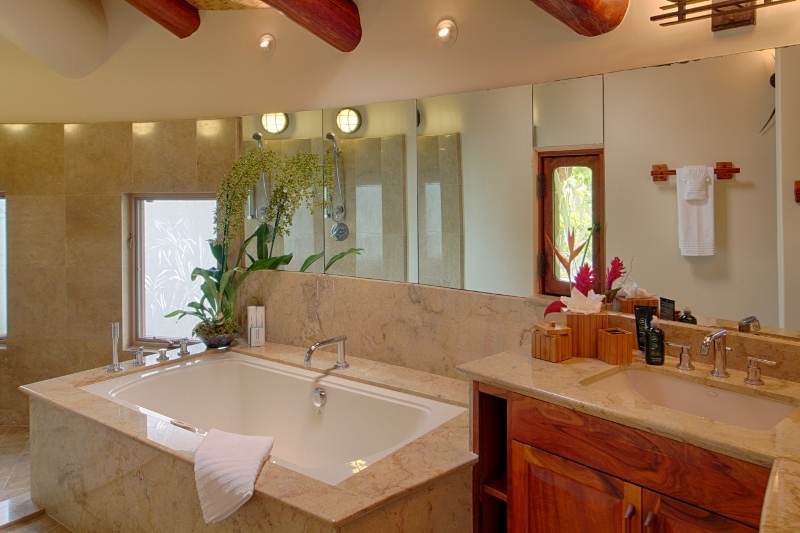 The apartment has its own living/dining area, kitchen and two bedrooms (sixth and seventh bedrooms) with ensuite baths. 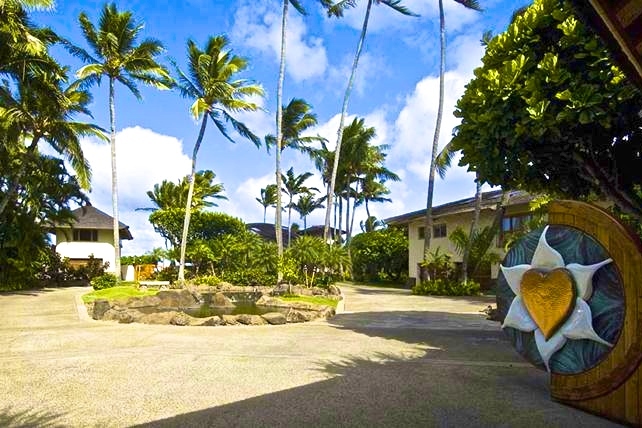 The Paul Mitchell Estate provides an ideal setting for travelers who value quality, privacy and security and the estate has received excellent reviews (and return visits) from many of the entertainment industry notables who have vacationed here. 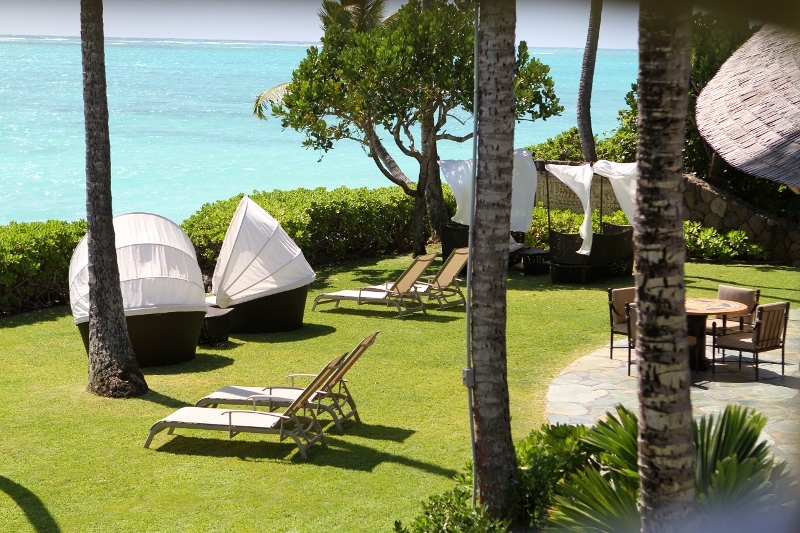 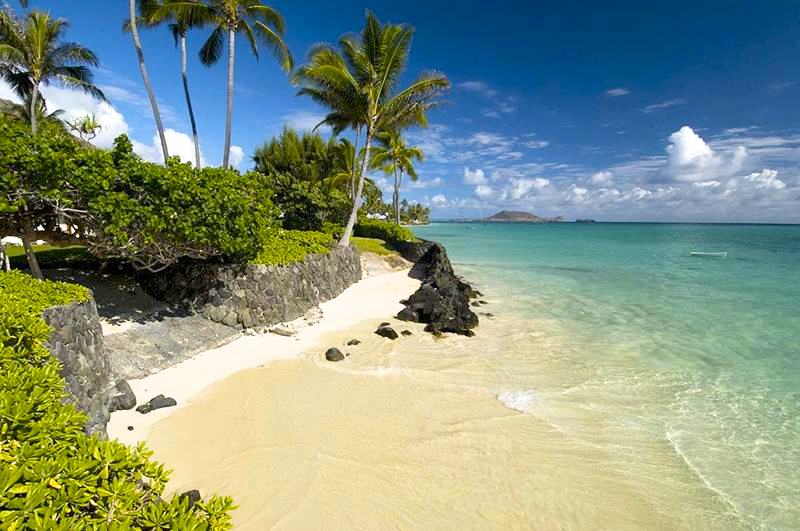 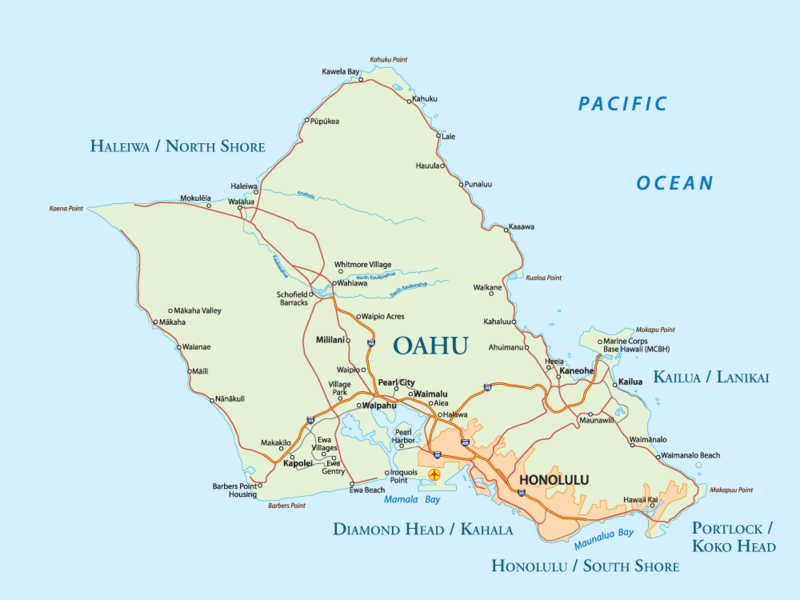 The estate is located 15 miles east of Waikiki in the serene residential area of Lanikai which has no hotels or condominiums and its reef-protected, white-sand beach consistently is ranked among the very best in the USA. 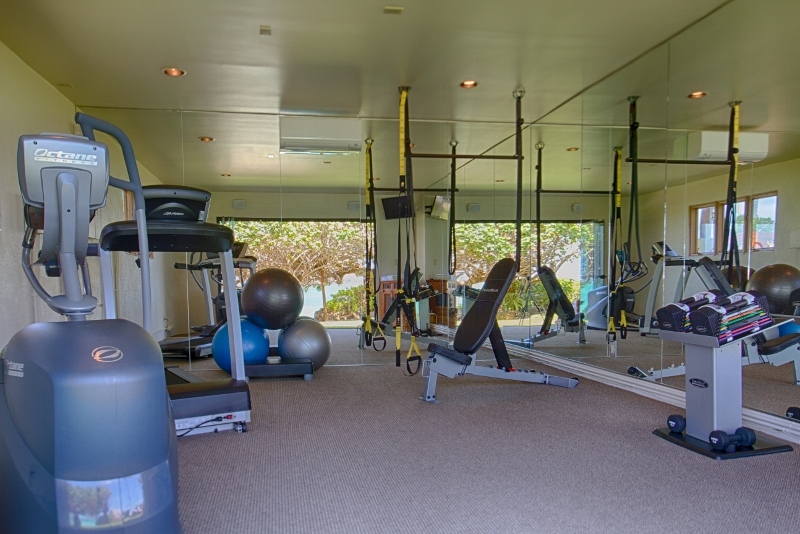 There are several golf courses, tennis facilities, great water sports activities, a variety of restaurants, grocery stores, theaters and a shopping mall; all within a 5-15 minute drive.